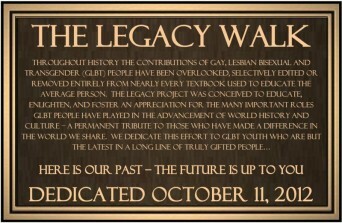 A global and historical first, the Legacy Walk will celebrate the lives and contributions of lesbian, gay, bisexual and transgender (LGBT) people to world history and culture. This outdoor museum will be dedicated in Chicago along a half-mile stretch of the “Northalsted Corridor” — the heart of the city’s diverse LGBT population. On October 11, 2012 — the 25th anniversary of “National Coming-Out Day” — the first 18 solid cast bronze plaques will be affixed to the celebrated “Rainbow Pylons” on the Northalsted Streetscape. Posted September 27th, 2012 & filed under News.